When my wife and I visited London in the late 90s, she found Silver Moon, a feminist book store in Charing Cross. She bought a sweatshirt that listed in alphabetical order many famous women writers, e.g., Wharton, Wollstonecraft, Woolf. 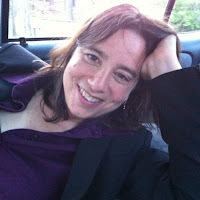 I was not familiar with the name Sarah Schulman, and in fact did not notice her name there, between Dorothy L. Sayers and Anne Sexton, until after my wife has completed her MFA at Goddard College, where Schulman was one of her favorite professors. For Thursday I read Trust by Sarah Schulman, and available from New Play Exchange. Like one of those caper films in which an ordinary, white seemingly blameless white guy gets sucked down into the dark seedy underworld, only to emerge by the final reel safe and sound, a bit wiser but confident in his place of privilege, Trust is a seriously dark comedy in which our protagonist (Steve, the whitest name) is hardly blameless, and his passage through the underworld unearned and undeserved. You know how we all know the drug war unfairly punishes people of color? This is a damning, hilarious and fast-paced illustration of that. This morning, before dawn, it was in the mid-sixties. I sat out on the deck and read in the dark.